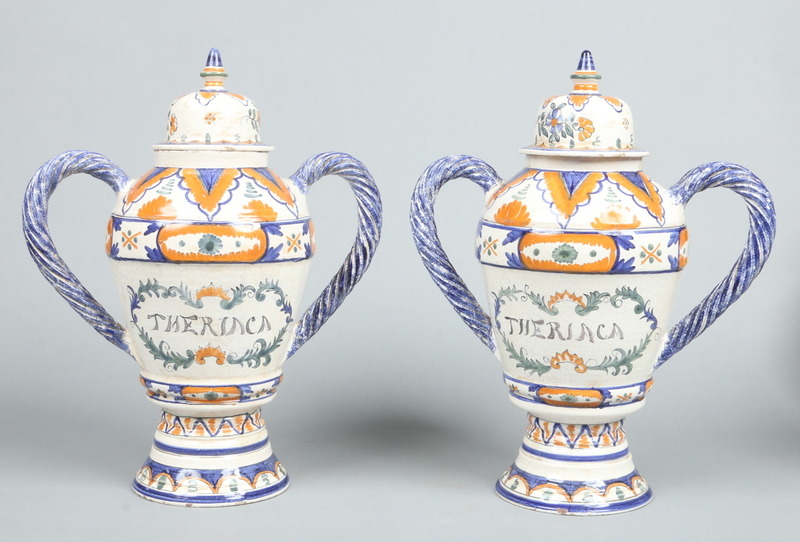 A pair of Continental faience Theriac drug jars. Unfortunately, your registration has been declined by the auctioneer. You can contact the auctioneer on +44 (0)1709 700005 for more information. You are the current highest bidder! To be sure to win, log in for the live auction broadcast on Mar 17, 2018 10am GMT or increase your max bid. A pair of Continental faience Theriac drug jars. With domed covers and each with twin ropetwist handles. Glazed in tones of blue, ochre and green. Painted marks, 50cm high (4). Condition Report. To be used as a guide only. Crazed. Some chips. Free from cracks and repair . Paul Beighton Auctioneers operate an in house post and packaging service to clients in the UK as well as across the globe. Your purchased items will be professionally packed by our experienced team and can be sent to you via Royal Mail or Parcel Force, goods are not insured against damage or loss. We do not post framed pictures / mirrors, very large items or liquids in glass bottles. There are a number of item categories that we cannot post internationally. We charge a nominal fee for packing your items plus the cost of the postal service. 1. In person at the saleroom If you wish to bid at the sale in person you must register with the office for a buyers number. If you have not purchased from us before you will be asked for identification. If you would like to bid for a lot but cannot be present we can bid on your behalf. Please let us have the lot number, a brief description of the lot and the maximum hammer price you are prepared to pay. We also need your name, full postal address and telephone numbers. You may wish to bid over the telephone if you cannot be present at the auction and do not wish to leave a commission bid. A member of staff will telephone you two or three lots prior to the one you wish to bid on and bid on behalf of you on instruction. To book a line please contact us with your name, telephone number and required lot number via phone, fax or e-mail. Please remember that we have a limited amount of telephone lines so in order to avoid disappointment book as early as possible. Telephone bids are only accepted on items estimated over £300. A buyers premium of 17.5% is payable on the hammer price of each lot purchased. VAT is charged on the premium only. Please be aware that in addition to our 17.5% buyers premium lots purchased through the-saleroom.com will be subject to a 3% surcharge upon the hammer price. All charges are subject to VAT. Winning bidders must settle their accounts and clear items from the saleroom within 5 working days of the sale. Postage quotes can be obtained by contacting accounts@pbauctioneers.co.uk, a recommended courier can also be sought from this email address. 2. Debit and Credit cards Most debit and credit cards are accepted there is a £200 limit on credit cards. We do not accept American Express. 4. We DO NOT accept cheques. Intending purchasers are in all cases solely responsible for determining the condition of lots prior to bidding, Paul Beighton Auctioneers Ltd do not guarantee that there are no defects or imperfections which have not been referred to in the lot description. When buying second-hand goods in auction the sale of goods act 1979 does not apply. If however a lot has been catalogued incorrectly your rights remain. If you find it difficult to view the sale, there will be a specialist on hand to deal with your queries. We will endeavour to give accurate reports using the naked eye only. Paul Beighton Auctioneers Ltd will not be held accountable for any flaws undetected during this service. Intending buyers must reach their own conclusions regarding condition. All electrical goods must be checked by a qualified electrician they may not comply with current British safety standards.